If you enjoy a superb light-hearted evening of songs and scenes from the Gilbert and Sullivan comic operas come along on Saturday 6th May. You will be treated to two hours of Savoy favourites, combining the wit of W.S Gilbert and the enchanting music of Sir Arthur Sullivan. 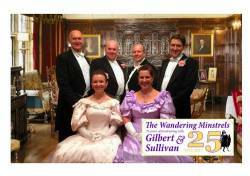 ‘The Wandering Minstrels’ are a highly accomplished group of five singers and their concert pianist. Their concerts of Savoy classics are presented in period costume and performed in traditional style. The majority of their performances are staged in parish churches, helping to raise much-needed funds for these wonderful buildings. The company has raised many thousands of pounds for numerous charities since its formation in 1992. They have performed in theatres and stately homes all around the country and have often appeared at the prestigious International Gilbert and Sullivan Festival in Buxton. At he reception from 6.45pm, a complimentary glass of "bubbly" and nibbles and a free programme are all available from a Gazebo adjacent to the Church Porch entrance, on production of your ticket. The performance will start at 7.30pm with one interval when there will be a bar available to purchase drinks. Bottles of red or white wine for the interval, @ £10 each, can be booked and paid for in advance with tickets. Tickets are £12.50 for seats in the centre aisle and £10 for seats in the side aisles. Please book your tickets from Julie Connell. Cash, or Cheques made out to PCC of Clipston with an SAE please. All Proceeds to All Saints Church, Clipston.